Light therapy has been shown in over 50 years of independent research worldwide to deliver powerful therapeutic benefits to living tissues and organisms. Both visible red, blue and “invisible” infrared light effect at least 24 positive changes at the cellular level. Light therapy causes biologic effects because different wavelengths are absorbed by specific proteins. Light Emitting Diodes (LEDs) are a form of light therapy that is a relatively recent outgrowth of the laser industry. LED disperses light (red, blue or infrared) over a greater surface area; this tends to result in shorter treatment times for a given area. 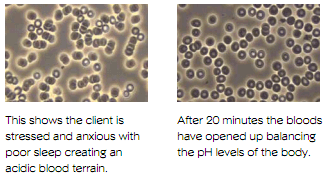 Pulsed Light is the most profound, safe, non-invasive way to “enlighten” your cells. Conscious Health Clinic, Halifax, Yorkshire. As a BBC channel declared in 2008: “light therapy beats plaque bugs”! Scientific studies are now discovering that blue violet and infrared light is an effective tool against periodontal conditions and overall health and well being. You will be treated preferably lying down in a relaxed position, or in some cases, sitting. The treatment is most effective if applied directly to the skin but can also work through clothing. You will slowly feel the light pads become comfortably warm. You may faintly hear some of the frequencies used in this treatment. Consulation is 30 minutes at a cost of £30.00.